Laura Surun is a Director at Accuracy. She specialises in valuations of companies or assets, as well as damages in the context of arbitration and litigation cases. Since 2008, Laura has been involved in valuation assignments in diverse contexts such as fairness opinions, transactions, fund raising, implementation of an employee shareholding fund, legal restructuring, tax purposes valuation, semi-annual portfolio valuation (investment fund). 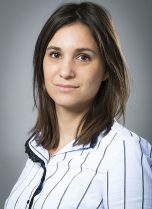 Additionally, Laura also has experience in the assessment of damages in international arbitration cases and litigation cases before French public courts, in matters involving breach of contract, shareholders’ or transaction-related disputes. Laura speaks French and English. Laura’s primary expertise lies in the valuation of businesses and intangible assets such as brands and patents, and various financial instruments including shares and convertible bonds. Laura has worked on a dozen of fairness opinions on French listed companies, among the most complex public offers which occurred over the last few years. Laura also regularly works for large family-owned or non-listed groups, in the context of annual valuation of their shares and ad-hoc assistance on transaction-related matters or shareholders’ disputes.